A late summer Oregon day, with no clouds, and no wind, seemed like the perfect day to go out to the Columbia Gorge to do one of the best bike rides in Oregon. That is the Columbia River Historic Highway trail, a smooth as glass, wide asphalt trail snaking under trees, hugging the rock guard rails and white beam fences that separate you from the cliffs overlooking the river.Â It is our preference to go into Hood River, taking the Highway 35 exit from I-84 and head up to the Mark O. Hatfield Trailhead.Â There is a small fee to park at the trail-head.Â Alternatively you can park at the base of the hill and ride up.Â Its a little steep and make sure you don’t park on private property. 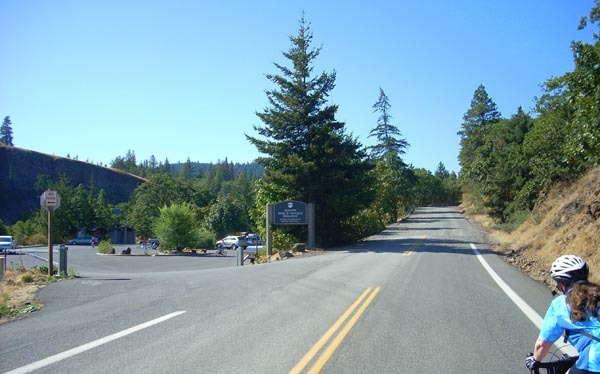 But hey, pay a couple of bucks to support the parks system or don’t use the rest rooms.Â After visiting the visitors center you can immediately hit the paved trail and begin the ride.Â The trail does have a few rolling ups and downs. 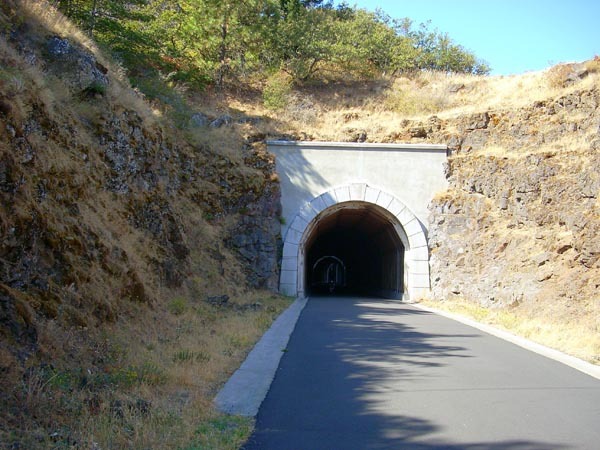 Its not entirely flat like the railroad bed Springwater Trail, but it is not particularly challenging, since this ride is all about the riding, not the finishing.Â After a few miles under the shade of the maples, the Mosier Twin tunnels emerge. The first thing you see is the rock retaining system built to catch and stop boulders the size of SUVs, preventing them from falling off the cliffs and inflicting much damage to things on the trail.Â If you look carefully, you will indeed see evidence along the trail of rocks falling and making large dents in the asphalt.Â The rock retainer is not an original structure, but it does seem like a pretty good idea. The tunnel is unique in that is has portals in it that provide unique views of the Columbia River. 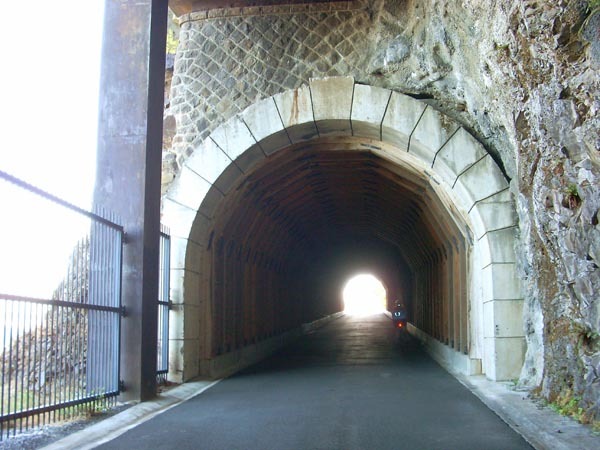 At the end of the paved bike trail, you emerge onto the section of the Historic Highway that is open to cars as well. At the stop sign, turn right and ride up the hill to the other Hatfield trail head. 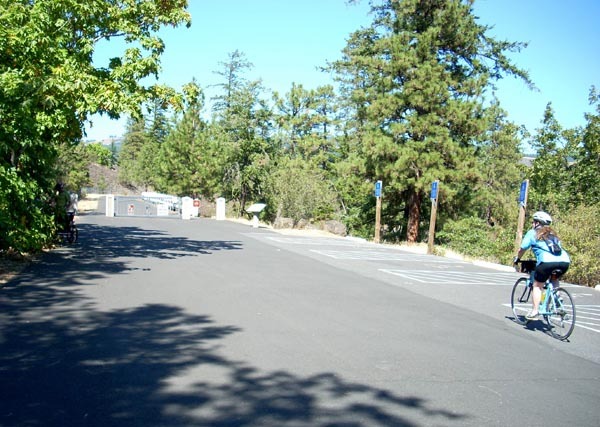 At the end of the paved road, you will find the trail-head on the left, where there is also another parking lot and restroom. The design of the highway is significant for many reasons. One of which was the desire to restrict the incline in order to make the drive more passable for cars of the era. As the sign shows, a ride throughÂ the gorge that is limited to 5% is pretty nice. Although, I dont know what to do with the knowledge that the cross slope is only 2%. 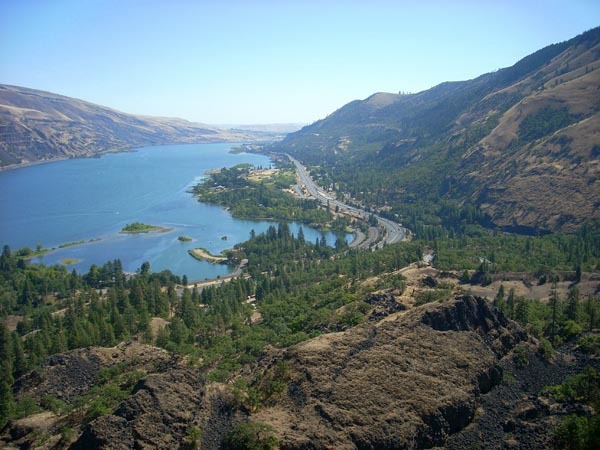 After a downhill plunge into Mosier, the road and the views open up to wide vistas filled with orchards,Â mountain sides, and the river. This road really isn’t used much for fast transportation. That kind of traffic prefers the interstate.Â The traffic on this section of the road are either locals, or those people that are out on their motorcycles and convertibles, just so they can enjoy the ride.Â These people are rarely a hazard for bike riders. 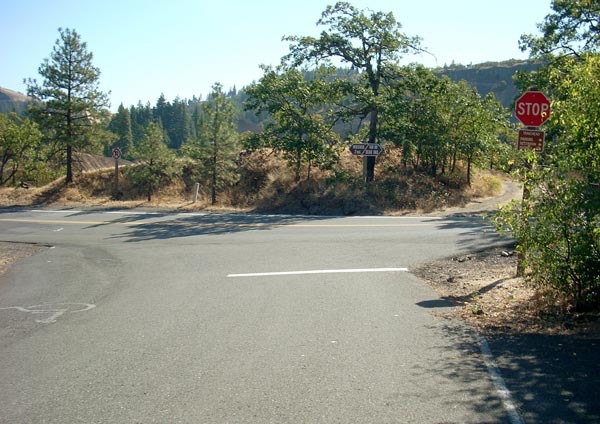 Continuing out the highway, about 11 miles from the end of the trail, you finish your climb up to Rowena Crest. Here is a great spot to soak in the sun and the views. 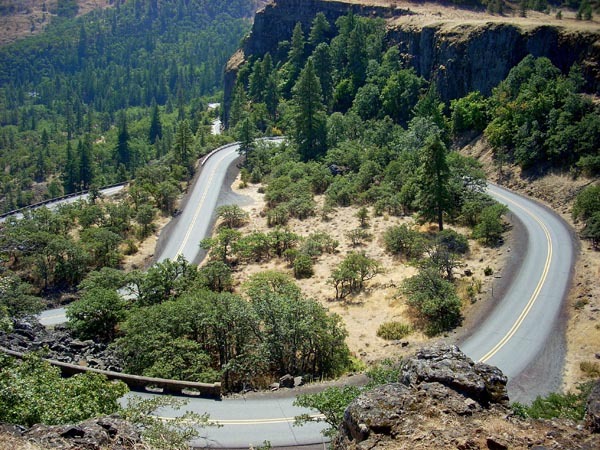 The other side of Rowena Crest, you can enjoy a fantastic descent through the switchbacks down to the river elevations.Â This road will then take you out to The Dalles.Â The Columbia River Interpretive Center is a great destination, to stop, look around, ride the trails down to the river, eat, use the restroom and then turn around to make the trip back.Â I usually have my doubts about those guys that boast about how great their climbs are, but this climb is a very good one. From the base, you look up to Rowena Crest, and it appears intimidating. But you have to remember that 5-6% incline limitation and take solace in all those switchbacks, then just settle in and enjoy the climb. Here we are heading back on to the trail, where the cars are not allowed.Â Its nice to see the availability of the handicapped parking right at the end of the trail. And riders need to keep in mind that this trail is not only for bikes. 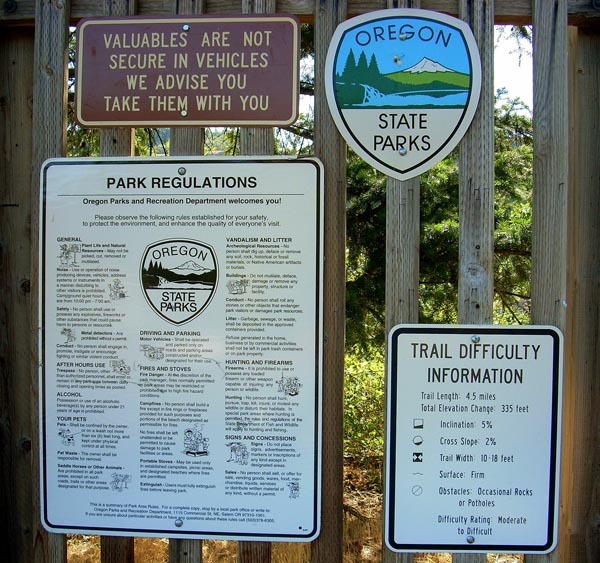 The trail really is one of the best rides in the state of Oregon, and we think fall is the best time to ride it. 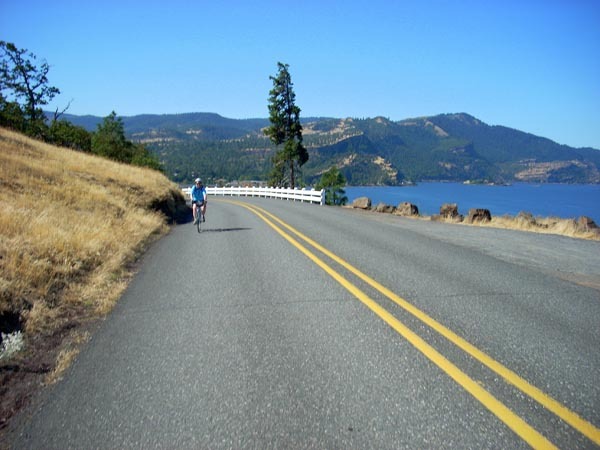 A ride from Hood River to Rowena Crest and back is about 24Â miles, continuing out to The Dalles will add about 22 to that total.Â We finish the day with a meal in downtown Hood River, and that makes for a great weekend. 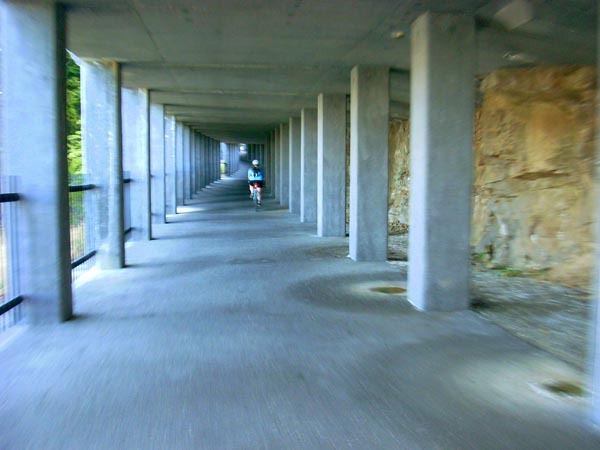 This entry was posted in Bicycling & Fitness on September 19, 2008 by golinielcomblog. 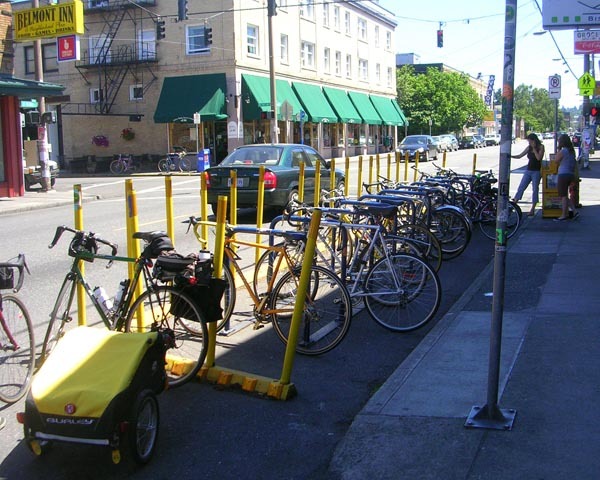 This entry was posted in Bicycling & Fitness, Portland, Or, Oregon on September 11, 2008 by golinielcomblog. 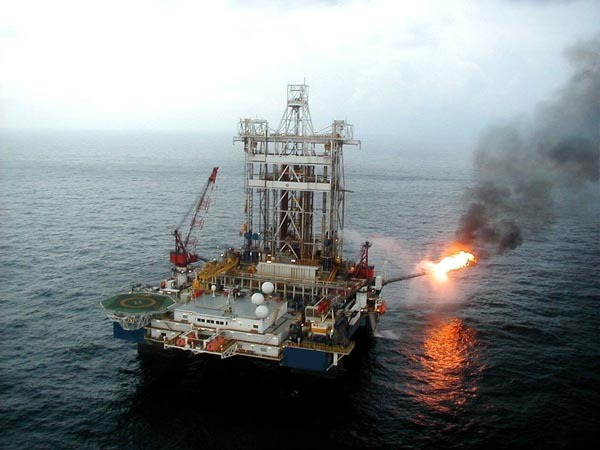 How my job compares to working an oil rig. 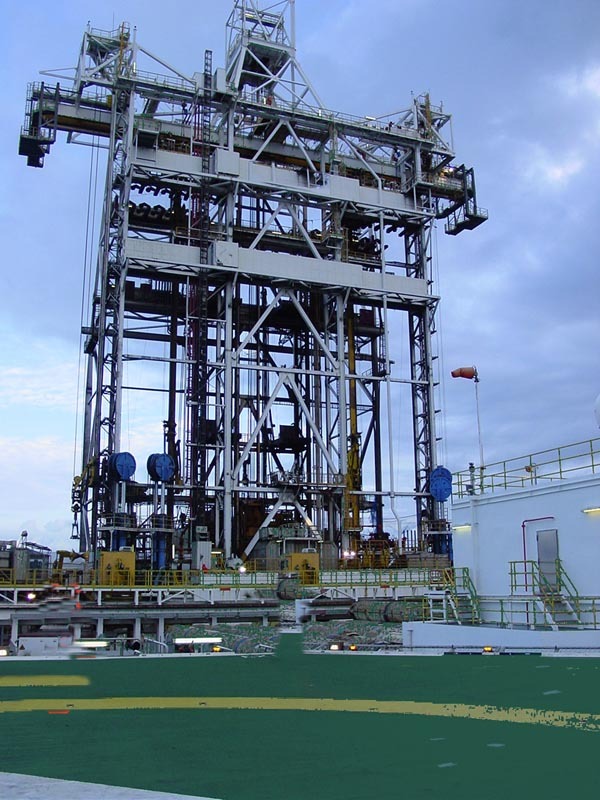 We have this somewhat distant relative that works on this seriously far away oil rig in the middle of an ocean.Â As I looked at these pictures, I wondered how working on a job like that must feel. And how that job compares to my job. To help me put it in perspective I thought that making a list of three similarities between working in this envrionrment and in my work envirronment,Â would beÂ of some help.Â Lets get started…..
Who am I kidding, I got nothing.Â I work in an office cubicle. 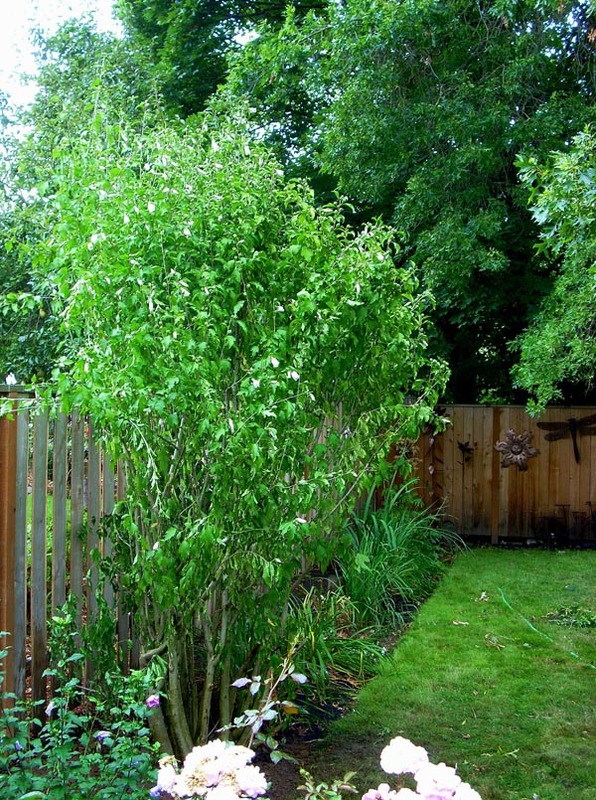 This entry was posted in Our Environment on September 3, 2008 by golinielcomblog. 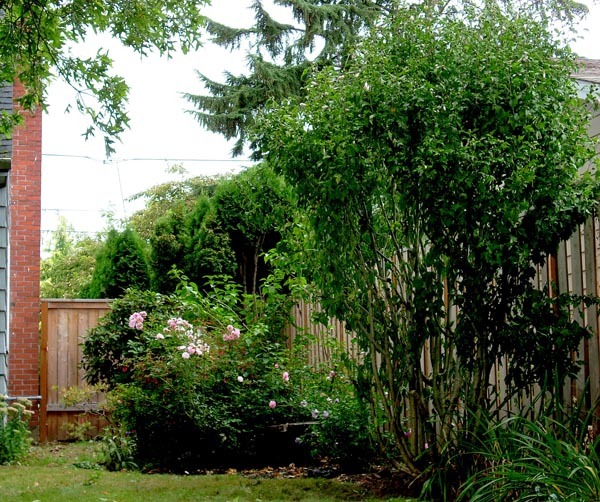 This entry was posted in Our Environment on September 1, 2008 by golinielcomblog.